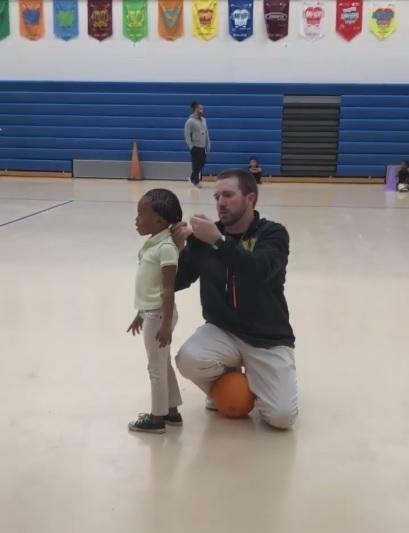 Kandice Anderson, WGN para, quietly filmed Coach Oliver as he helped a Kindergarten student put her hair in a ponytail a few weeks ago. She then played back the video for the coach and asked, "Would you mind if I shared this on Facebook?" So with his permission, she posted and jokingly said, "this is going viral!" Little did she know that it actually would. Since January 25, this video has been shared on Facebook over 53,000 times with almost 3.1 million views. Anderson was contacted by a social media intelligence and news agency called Storyful requesting exclusive rights to the video content in an effort to share with larger, national media markets. Today, Good Morning America has shared the story of Coach Oliver, Ms. Anderson, and the precious WGN Kindergartener, Kristin Paulk. Coach Oliver is sincerely shocked the video has received so much attention, much less national attention. As he told Good Morning America, "We [teachers] want to make them feel like they're at home and that they enjoy being here. We try to love on them as much as possible. To me, it was just a ponytail." Thank you, Ms. Anderson, for capturing this precious moment and sharing it with your friends. Now the whole world can know that there is #NunnBetter than the faculty and staff in all of Valdosta City Schools.